Many people think of male pattern baldness and age-related hair thinning when they think of hair loss. Yet many other kinds of problems can lead to the loss of hair. One example is the connection between hair loss and anorexia. Our New York, NY hair restoration specialists have helped people suffering from eating disorders address the hair loss and hair thinning they’ve experienced. Let’s take a moment to consider what causes hair loss during an eating disorder and what treatments are most ideal for these issues. Why Does Anorexia Lead to Hair Loss? There are two ways that anorexia can lead to the loss of hair. Nutritional Deficiencies - Heathy hair is sustained when you’re eating a healthy diet. People who suffer from anorexia are depriving themselves of essential vitamins and minerals as well as other building blocks of healthy hair. This lack of nutrients can result in hair that is brittle and dry, eventually resulting in excessive hair loss. Shock to Your System - An eating disorder can place a lot of stress on your body and its normal function since your body is starving for fuel. When this happens, your body’s response could be to shut down inessential functions so essential bodily functions can remain optimal. This often means your hair follicles will return to a resting phase, resulting in hair loss and delayed hair regrowth. How Extensive Is Hair Loss from Anorexia? As you can imagine, these two issues in combination can lead to pretty extensive hair loss. The amount of hair lost can vary from person to person, but it will be noticeable. 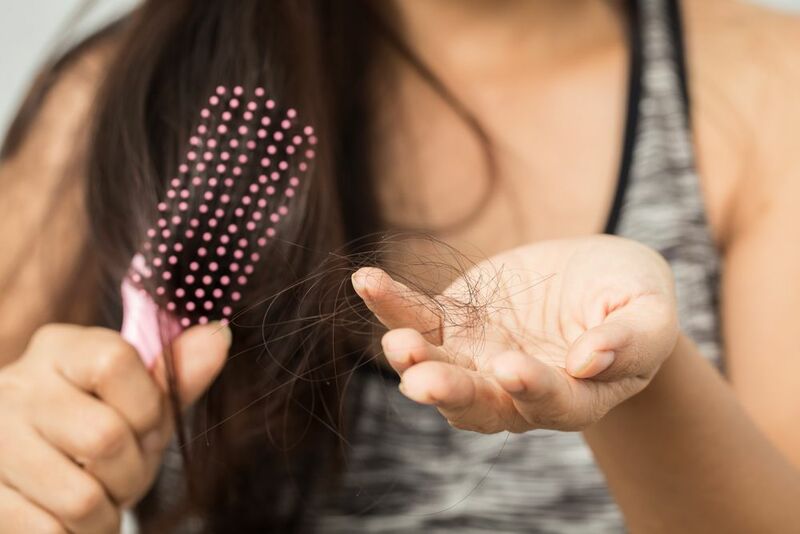 People lose hair naturally even day, but anorexia can lead to far more pronounced hair loss, which a person will notice in the shower or when combing, brushing, or styling their hair. Will I Need Hair Transplant Surgery? No. Not from anorexia-related hair loss. While the hair loss can be pronounced, it is diffused all over the scalp for most people rather than centered in a single spot. What’s more, the hair loss is temporary and often reverses once a person returns to normal eating habits and a healthy diet. A hair restoration specialist may be able to help promote faster hair regrowth, but it will typically be done without the need for transplantation surgery. The most important thing you can do first is to get treatment for your anorexia. Discuss your struggles with loved ones for emotional support, and speak with your doctor about getting the help you need. Overcoming eating disorders can be difficult, but a combination of professional help, the support of your loved ones, and an emphasis on self-care can be extremely helpful in improving your body image and your relationship to food. As noted above, a hair restoration specialist may recommend minoxidil to help promote hair regrowth. This non-surgical treatment involves applying the solution directly to the scalp. For men whose hair loss was caused by an eating disorder, Propecia may be recommended. For more information about treating hair thinning and improving the appearance, be sure to contact the hair loss specialists at True & Dorin Medical Group. Our team will help you have a healthy, full head of hair again.